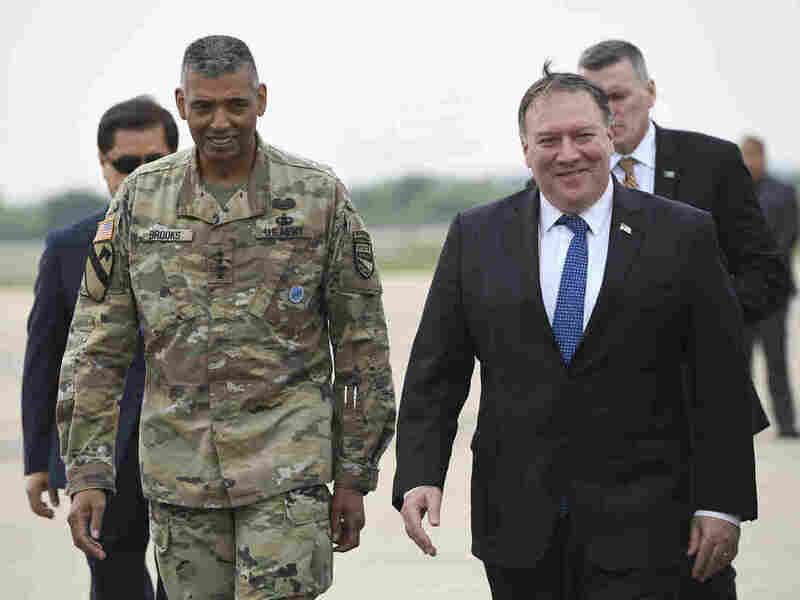 Pompeo: North Korea Will Take Major Steps To Disarm In Trump's First Term He told reporters in Seoul on Wednesday that the country will take steps to disarm in two and a half years. But details of the agreement between President Trump and Kim Jong Un remain vague. Secretary of State Mike Pompeo walks with General Vincent K. Brooks, commander of United States Forces Korea, after arriving at Osan Air Base in South Korea Wednesday. "Most certainly in the president's first term," he said, speaking to a pool of journalists in Seoul, South Korea, where he was meeting his South Korean and Japanese counterparts. Pompeo told reporters he wasn't going to get into what President Trump and North Korean leader Kim Jong Un discussed during Tuesday's historic meeting in Singapore. "I'm not going to give any insight into where we are in private talks," he said. The joint statement released Tuesday was scant on the details, leaving the agreement between Trump and Kim vague. Earlier today, North Korean state media reported that Trump made concessions to Kim that were not in the statement signed by the leaders — including Trump agreeing to "the principle of step-by-step and simultaneous action" rather than the U.S. administration's prior demands for rapid denuclearization. Seeking to quell concerns that North Korea and the U.S. interpreted the talks differently, Pompeo said, "I am confident that [North Koreans] understand what we're prepared to do." He told reporters that "one should heavily discount some things that are written in other places — including from some of your colleagues!" When asked why the words "verifiable" and "irreversible" weren't included in the statement — words that form part of a State Department policy of "complete, verifiable, irreversible denuclearization," or CVID, before lifting sanctions on North Korea — Pompeo said, "I find that question insulting and ridiculous and frankly ludicrous." He said that the concepts were encompassed within the word "complete." Pompeo, who is scheduled to travel to Beijing Thursday, said he isn't sure when the next conversation with North Korea will next take place but that it could happen "fairly quickly" — as soon as the coming week. Frank Aum, a senior expert on North Korea at the U.S. Institute of Peace, told NPR that "Pompeo is correct that a significant portion of the denuclearization process could technically occur in two-and-a-half years," including the freezing of all nuclear and missile activities and the shutting down of known nuclear facilities. But it "all depends on whether North Korea is serious about denuclearization." He added that it would be impossible to verify completely whether North Korea completely denuclearized. "The country has an extensive network of sites and underground tunnels that can be used to hide material. Even with intrusive verification, if we suspect North Korea has enough fissile material for 35 weapons, and they declare only 30, we wouldn't be able to find the remaining amount quickly." Joel Wit, a Stimson Center senior fellow and North Korea expert, told NPR that in such a timeline "you could probably disarm key portions of the North Korea nuclear program. For example you could probably have them give up their nuclear weapons, or you could find and verify and maybe disable key sites... but it's not possible to dismantle or disable all their nuclear infrastructure or to redirect scientists who work on nuclear weapons to civilian jobs." Pompeo also sought to downplay Trump's announcement on Tuesday that military exercises with South Korea would be suspended in return for North Korea's denuclearization. He said that Trump "made it very clear" that the suspension would only last while "good faith negotiations" continued. The next military exercise is scheduled for August, and in years past, has drawn thousands of troops from the U.S., South Korea and other countries. Pompeo's remarks follow Trump's Trump's tweets Wednesday, after returning from the summit. "Just landed — a long trip, but everybody can now feel much safer than the day I took office. There is no longer a Nuclear Threat from North Korea. Meeting with Kim Jong Un was an interesting and very positive experience. North Korea has great potential for the future!" "There are always concerns about President Trump and he's very erratic," Wit said. "Publicly he keeps saying things he shouldn't say. But I think so far [the negotiations with North Korea are] meeting the minimal standards for success. And the issue is now, where do we go from here — whether we can maintain momentum from the summit and start putting flesh on those bones."